Breaking the blockade of Cuba! On Tuesday 14 February 2012, the year of the London Olympics, the Rock around the Blockade brigadistas visited a Cuban Institute for Sport and Recreation (INDER) project at Ho Chi Minh Park, Havana and presented the project with £650 of material aid including footballs, volleyballs, basketballs, football nets, bibs and gloves. Why support the Cuban 5? Rock Around the Blockade decided to call our February 2012 solidarity delegation to Cuba 'Justice for the Cuban 5 Brigade' in honor of the five brave Cuban prisoners of imperialism unjustly incarcerated in the US for the last 12 years. During the brigade we met with Kenia Serrano, president of the Cuban Insitute of friendship between peoples (ICAP) who gave us this message emphasising the need for a continued political campaign internationally to free the five. Havana, Feb 15 (Prensa Latina) Members of the Revolutionary Communist Group of Britain expressed their admiration on Tuesday for the achievements of the humanistic process started in Cuba by leader Fidel Castro in 1959. During a visit to a park in Havana, where people from different generations gather to practice sports, these friends of Cuba donated a series of sports equipment to the National Institute of Sports, Physical Education and Recreation and spoke with children, mothers and elderly people. Between 9 and 22 February 2012, 13 Rock around the Blockade activists visited Cuba on the campaign’s 12th solidarity brigade to the revolutionary island. During their 2-week visit, brigadistas witnessed the realities of Cuban socialism first-hand - from meeting revolutionaries organising in their local communities (Committees for the Defence of the Revolution) to working alongside farm workers and discussing the latest developments in Cuba with trade unionists and Communist Party members. In Britain today people with disabilities claiming incapacity benefit, must go through a humiliating and daunting health assessment carried out by a private multinational contractor – Atos Origin – to determine whether or not they are ‘fit for work’. Ever more stories of injustice, abuse and trickery emerge as Atos ploughs its way through over two million people. 40% of those found ‘fit for work’ and kicked off their benefit have subsequently won their appeals. For the other 60% (which has included non-terminal cancer sufferers and people with mental health problems) it is straight to job searching or work; if they protest they risk losing all entitlement to benefit. To cope with such a situation, job centres have been giving staff training on how to deal with people threatening suicide. 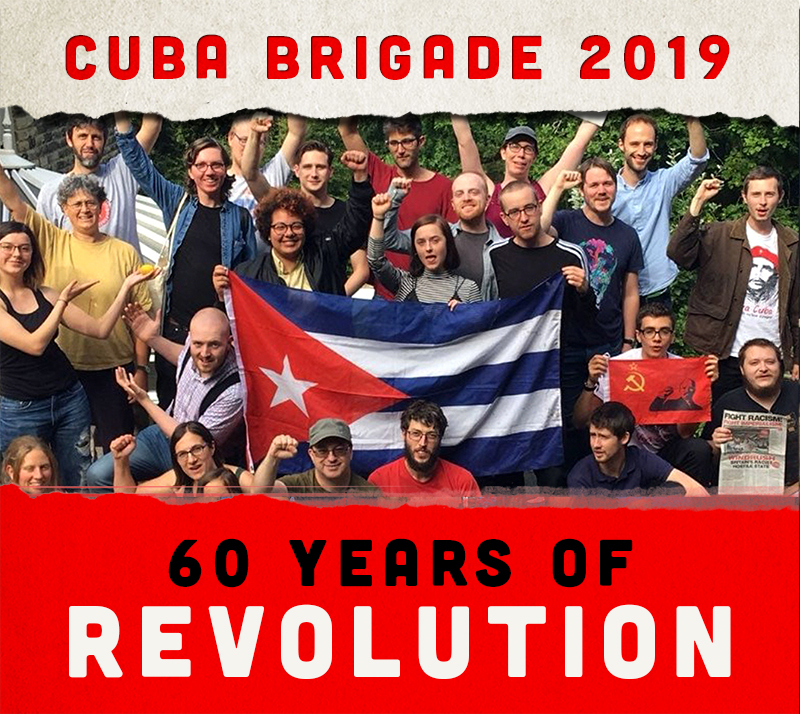 Between 9 and 23 February 2012, activists from the British campaign in solidarity with socialist Cuba, Rock Around the Blockade, will be in Cuba for the group’s 12th brigade; the ‘Justice for the Cuban 5’ brigade. Hosted by the Union of Young Communists (UJC) the brigadistas will visit numerous cen­tres, institutions and organisations, meeting political lead­ers and doing agricultural work. They will visit old peoples’ homes, maternity homes, youth, community and sports centres and schools. They will go to a hospital that treats children with cancer; victims of the genocidal and illegal US blockade of Cuba, which prevents the Cuban government from buying the medicines that are necessary to treat them because they are patented in the US. On Friday 20 January, the audience in Bolivar Hall was treated to a feast of classical music at Rock around the Blockade's delightful evening to celebrate the 53rd year of the Cuban revolution and to raise funds for the organisation's February brigade to Cuba. £800 was raised, with all the money going for material aid for children in hospital and sports equipment. Guitarist Ahmed Dickinson, mezzo soprano Sarah-Jane Lewis, Eralys Fernandez on piano and Emma Blanco on violin, along with accompanist Neus Guiu Ritort, performed a variety of pieces from Bach and Bartok to English composer Myers, Italian composer Domenicon, Spanish composers including Obradors, de Falla and the Catalan Albeniz, Argentinian composers Piazzolla and Guastavino and Cuban composers Grenet and Lecuona. Eralys and Ahmed are from Cuba, examples of the musical talent that the Cuban Revolution has nurtured and encouraged. Eralys gave a short and informative introduction about the composers. The audience was blown away by her virtuouso performance. By a happy coincidence, she comes from Guanabacoa, the part of Cuba where the brigade will spend half its time and where the brigadistas will contribute their voluntary labour. After the musicians took their bow, Eralys and Sarah-Jane returned for an encore and Sarah-Jane sang Habanera from Bizet's Carmen with Eralys on the piano - a passionate end to a fantastic evening. Rock around the Blockade thanks all the performers and all those in the audience who were very generous in their donations. We will be reporting back from the brigade at meetings in London, Newcastle, Manchester and Glasgow. Sarah-Jane graduated with First Class Honours from the Royal College of Music in 2009. Her oratorio repertoire includes Handel, Mozart, Vivaldi, Rossini and Dvorak. Sarah Jane’s opera chorus work includes work for the Classical Opera Company in Cosi Fan Tutte and for Kenneth Branagh in the film version of The Magic Flute. In September 2011 Sarah-Jane began a Master of Arts programme at the Royal Academy of Music.